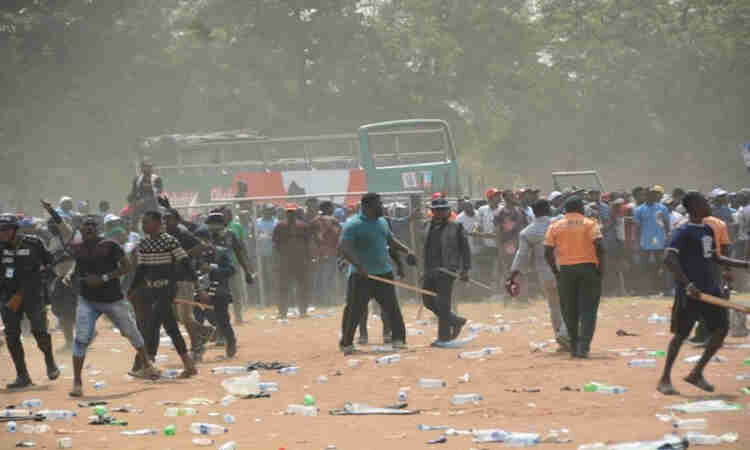 However, in a new interview with The Nation, Sego denied the allegation of disrupting the rally or stabbing MC Oluomo. He challeneged the police to provide a video that captured him stabbing Oluomo. “Whoever has any videotape of Sego unleashing mayhem on people should let the world see it. Whosoever has any evidence against Sego should come forward with it. That’s what I want. “Anybody can fight for his right with his mouth by speaking against what he feels is not right. Besides, employing the use of a weapon is against the law and nobody on Tuesday can say he or she saw me with any weapon. For emphasis, I did not hold any weapon on that day. I only spoke against what is not right. I went to the rally as a member of Team Lagos and not on behalf of the union. I have been a party member since 1999 and we have been in Team Lagos since then. Also speaking, another member of NURTW, Semiu Omosansan, accused the police of being biased and wanting to frame Sego up. According to Omosansan, Sego was not in the place where MC Oluomo was stabbed at the rally. “Adekunle Mustapha (Sego) was not at the place where union’s state Treasurer Musiliu Akinsanya (aka MC Oluomo) was stabbed. The incident occurred on the stage where K1 (Wasiu Ayinde Anifowoshe) was performing and he is alive to bear witness that Sego was nowhere close to the stage. This is not the first time MC Oluomo and Sego will attend APC rally as party members and such unfortunate incident has never happened until the state Chairman (Tajudeen Agbede) and his boys decided to attend last Tuesday’s event. The Lagos state police command spokesperson, Chike Oti, however, says their is a video of Sego attacking people at the rally.